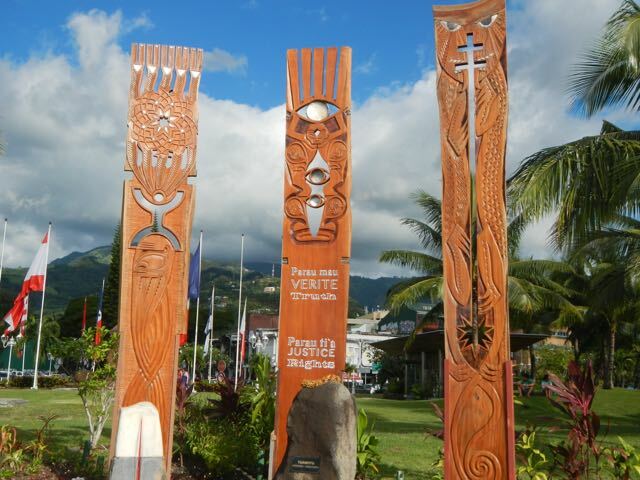 As we've said, we're here in Papeete, and we're determined to see all that we can. Conni, as she often does, had a brilliant idea: take the ferry to Moorea and see the place. Well, OK! We strolled downtown to the ferry terminal to buy tickets for tomorrow's journey (Saturday). Join us. 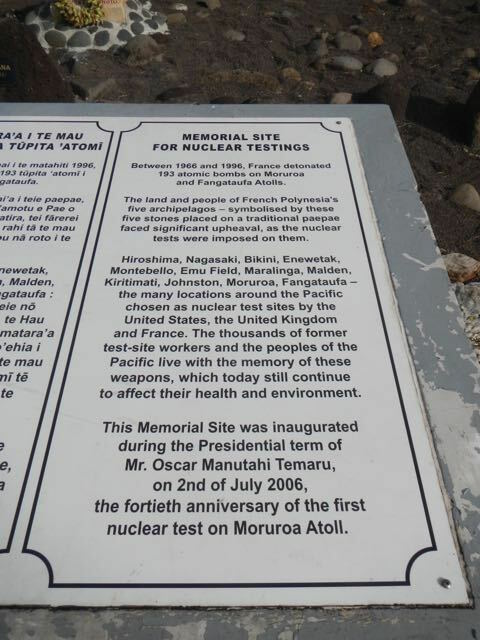 50 years ago, 2 July 1966, the French conducted their first atomic bomb test detonation on Mururoa, an atoll in the southern Tuamotus in French Polynesia. Many nuclear tests were conducted there - Mururoa Atoll was for them what Bikini Atoll was to the U.S. - remote and far away and therefore seemingly "expendable." 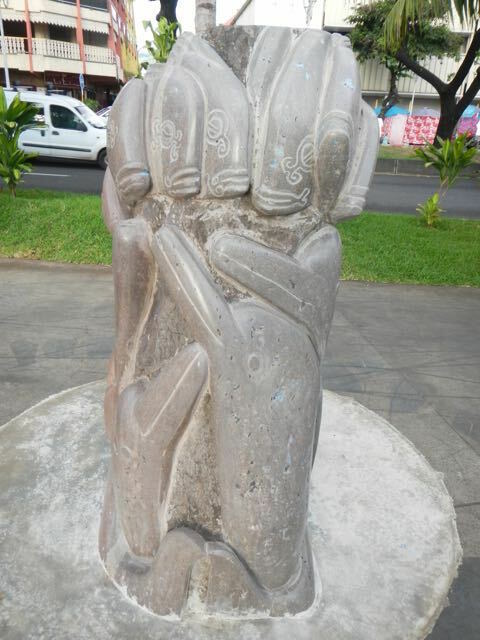 The Polynesian people, as you might imagine, feel differently. As a culture, they've become extremely anti-nuclear, as you can imagine. Mururoa and Fangataufa atolls and the area around them are still off-limits to cruising sailors. This lovely memorial commemorates the 2 June 1966 nuclear event. 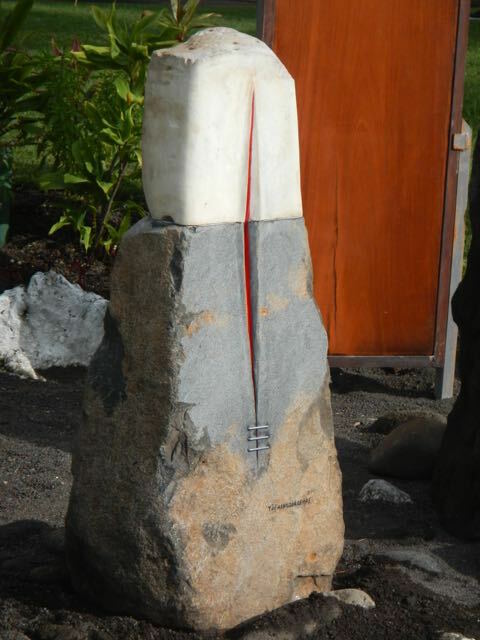 This memorial is just outside the gate to our dock, so we've seen it every day. Read it and weep. There are many citizens who remember the tests, and a few who were removed from their home islands because of the testing. This hauntingly beautiful stone was just added to the memorial this week to commemorate the 50th anniversary of the first French test. It's very evocative of the underground detonations. What can one do to move past the nuclear event commemoration? 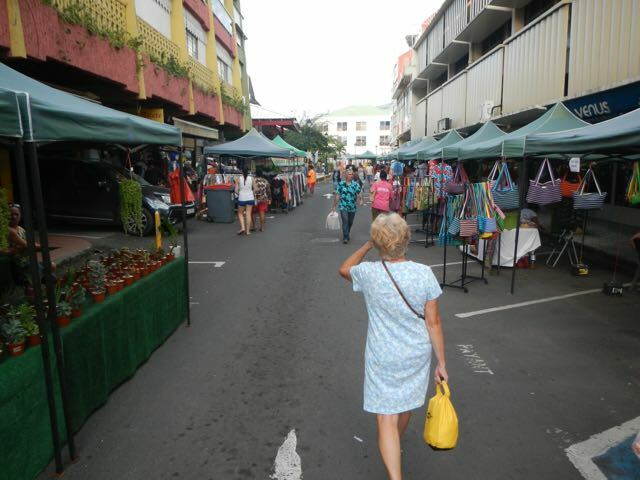 Find the Vanilla Market in Papeete and go shopping! Conni's examining vanilla products. 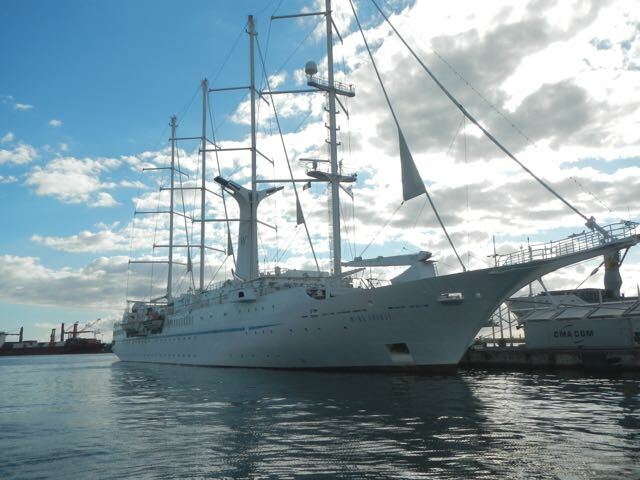 Wind Spirit, the "sailing ship" (really a small but lovely conventional cruise ship with largely decorative masts and sails) that plies the islands, here at the dock in Papeete awaiting a new load of well-paying passengers. 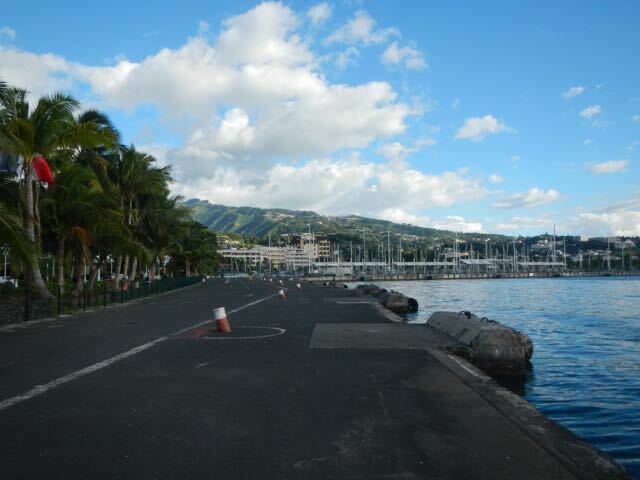 Papeete's beautiful dock area, with the sailboat marina in the background. This odd vessel is the M/V Arenui. It's half cargo (towards the bow at the right) and half passenger ferry. 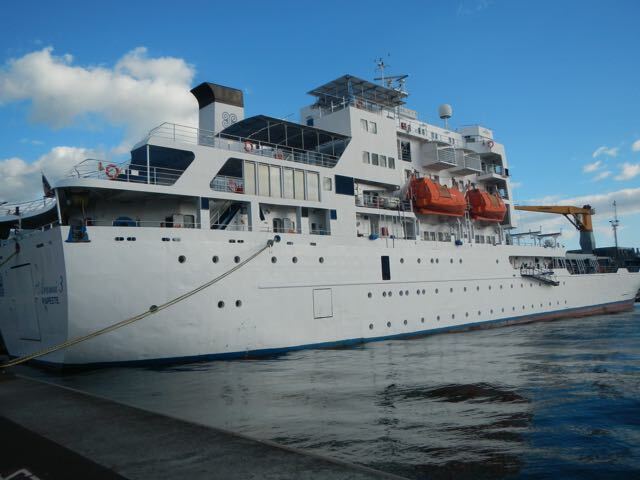 It voyages inter-island to some of the more distant islands of French Polynesia, while the various Aremiti ferries shuttle back and forth between Tahiti and Moorea. 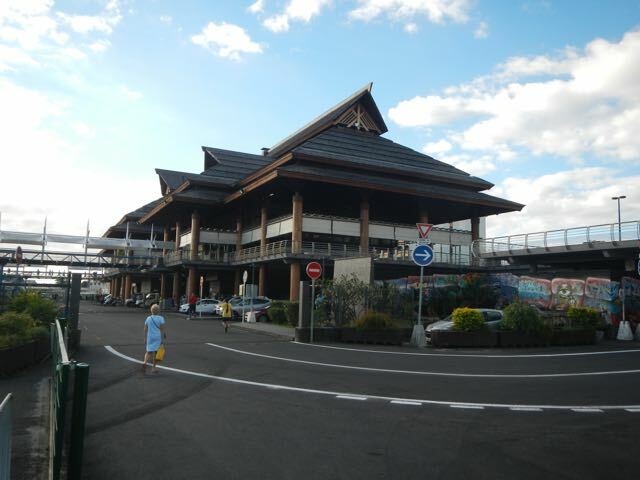 The Ferry Terminal in downtown Papeete. It's an open air building, of course, and quite lovely. Conni's on a mission to buy tickets for the ferry to Moorea. 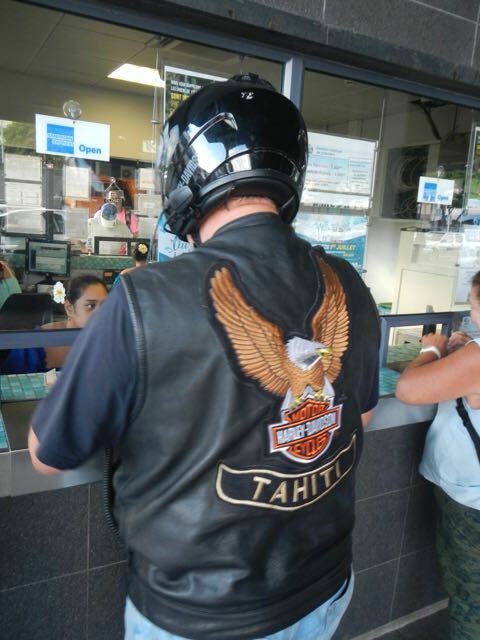 OK, who knew there was a Harley club in Tahiti? This guy is definitely a true believer, wearing a leather Harley vest in the heat. He had a microphone protruding from his helmet and his ride was, well, dressed to kill. 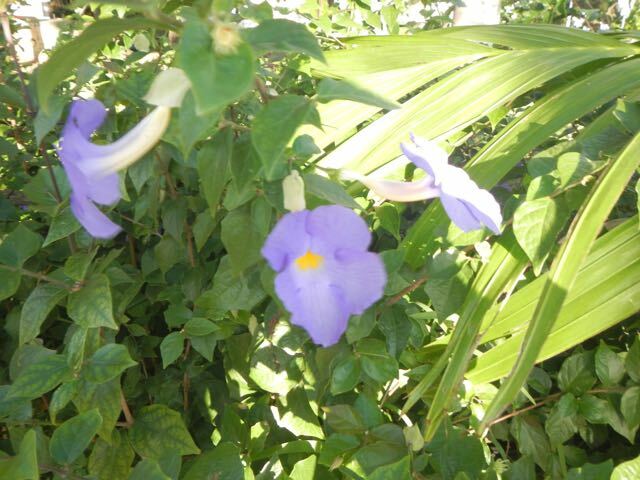 These pretty lavendar-colored flowers look to be of the nightshade family but we're not sure what they really are. The low bushes are planted throughout the waterfront dock and park area. 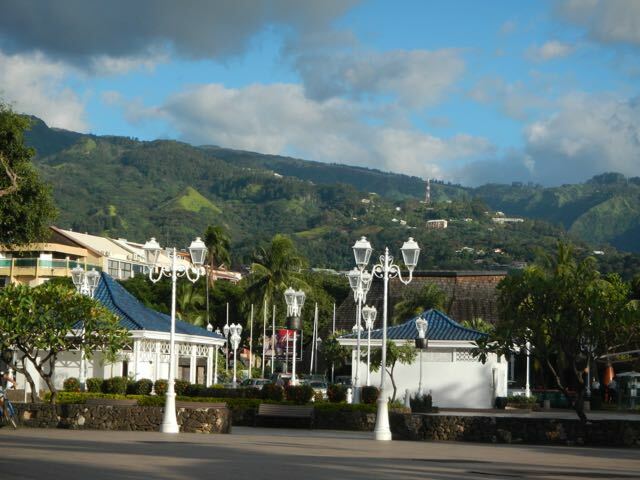 Just another photo of how pretty Papeete is. We love the elegant street lamps. 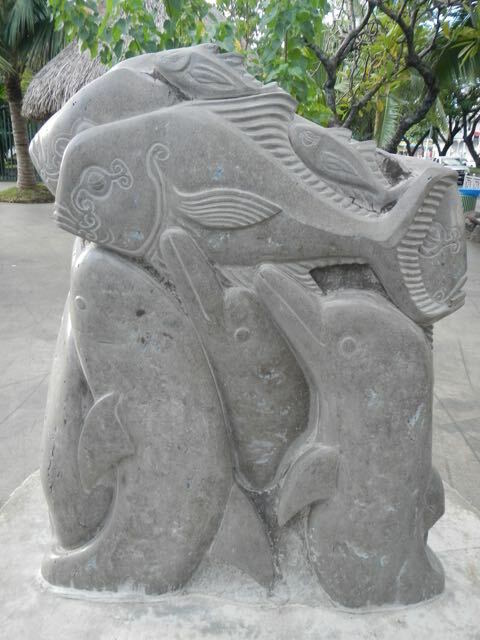 We were taken by this lovely sculpture of dolphins (bottom) and fish (top), here seen from the side. And here's the front. Very cool! Conni strolling through a small street mall. Anchorage has no street decorations like this. 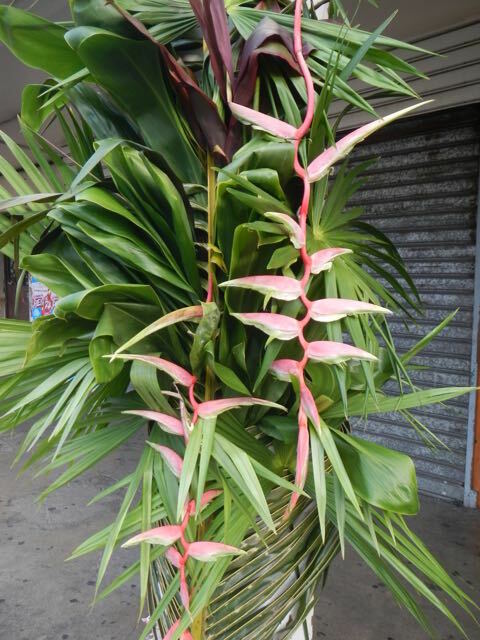 The green is palm leaf and the flower is unknown to us but resembles a Bird of Paradise. Regardless, it's beautiful. The streets are being decorated for the Heiva, an annual cultural celebration full of inter-island singing, drumming and dancing competitions and va'a (outrigger canoe) races. Mmmmmm . . . 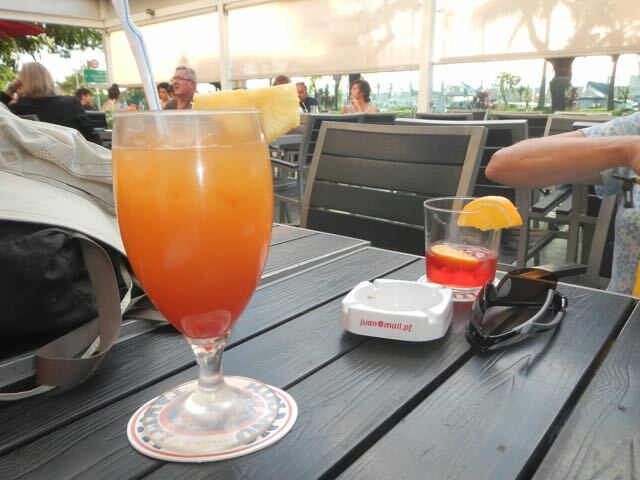 Le Retro is a venerable sidewalk cafe and lounge in downtown Papeete. We developed an afternoon thirst and stopped for a delicious Mai-tai and a Compari. And then it was Happy Hour! Darn the bad luck, we had to have another. 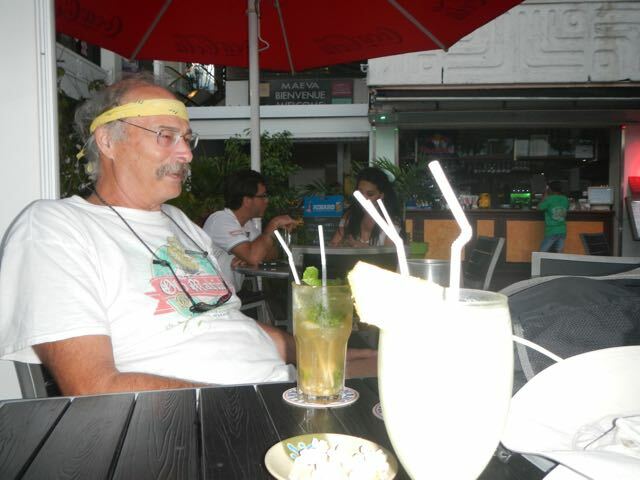 Two drinks in, Bill finally loosens a bit. Obviously we stayed a while, since it's now dark. This tiny, beautiful grandmere (grandma) came by selling hand-made flower leis, watched over by her shy grandson. 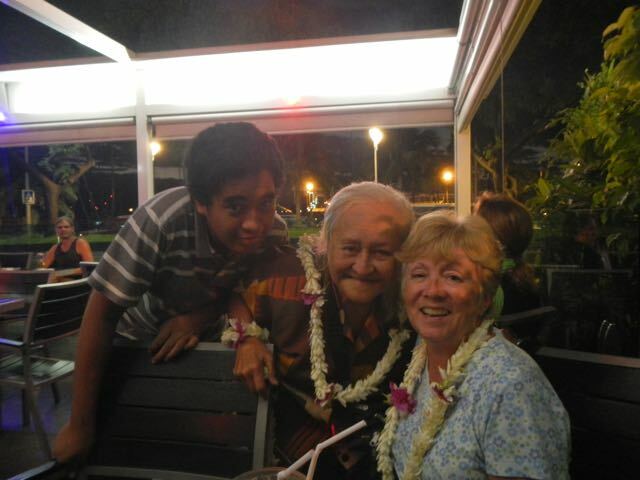 Bill bought a tiare (Tahitian gardenia) lei for Conni and then asked the lady to pose with her. Is this cool or what? It took a bit of coaxing to get the young man to join the photo. We had so much fun the two ladies sitting behind us bought a lei and took a picture as well. 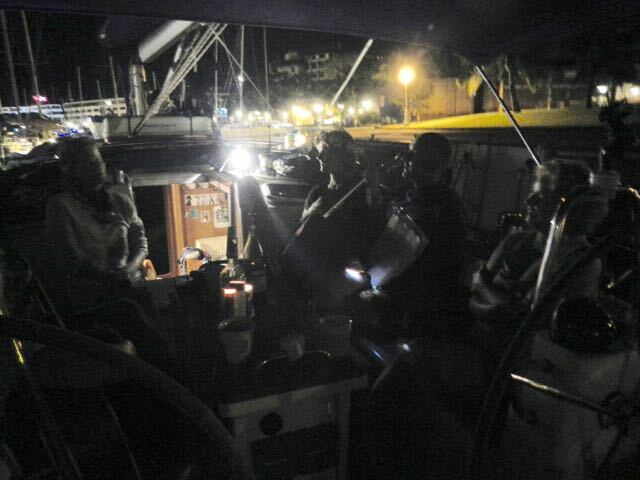 Our Aussie friends on S/V Blue Heeler, whom we met in late May when we were all working on our boats in the boat yard on Raiatea, reappeared a couple days ago at the dock in Papeete. Such is cruising - you make friends as you go, and then often run into them again on some other island. We had an impromptu birthday celebration for Ruth (the mother) with a cockpit party full of wine bottles and some ukulele and guitar playing. Ruth is in the center playing her uke, husband Karl at right. Conni joined the other musicians and played and sang. You can always find a few songs that everyone knows.